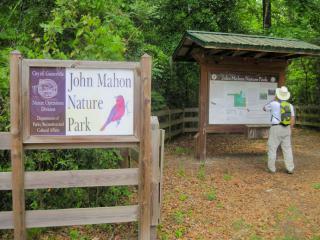 Located just off Newberry Road, John Mahon Nature Park features a loop trail through the forest. Visitors can enjoy upland mixed forest, hydric hammock, and former upland pine forest as they hike the trail. The park serves as a memorial to Dr. John Mahon, who lived nearby, and who worked tirelessly to preserve large areas of Paynes Prairie, San Felasco Hammock, and the Hogtown Creek Greenway as natural public lands. Dr. Mahon devoted a substantial part of his life to public service and was well respected and active with many conservation organizations.